In 2013, the Port Board of Commissioners adopted Ordinance 2013-1 for regulating conduct on Port property in an effort to provide the public with clear rules and regulations that aim to keep all users safe & secure as well as maintain the property in good condition for continued use. SECTION 1. Scope of Ordinance. This ordinance regulates conduct on Port land, Port waterways and Port structures. “Board” means Port of Skamania Board of Commissioners. “Camp” (does not apply to Section 9) means erecting a tent or shelter, arranging bedding or occupying a parked vehicle, trailer or camper for purposes of, or in such a way as will permit, sleeping or remaining overnight. “Commercial Activity” means any activity directed to the general public or between two or more persons or entities undertaken for profit or personal gain. “Dock” means a wharf or platform for loading or unloading people or materials. 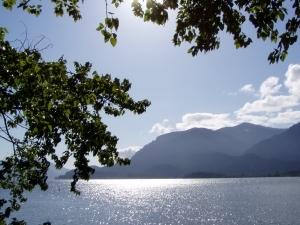 “Waterfront” means Port property located along the Columbia River in Stevenson, Washington and in Skamania County. “Executive Director” means the person the Board has appointed to act as the general manager of all Port operations. “Leavens Point” means Port property which includes a water access located easterly from Stevenson Landing, northerly from the Columbia River, westerly from East Point, and southerly from Cascade Avenue at Leavens Street. “Kanaka Bridge” means the bridge owned by the Port which crosses the Kanaka Creek. “Bob’s Beach” means Port property located easterly of Port office, southerly from Cascade Avenue, westerly from the log cabin lodge and northerly from the Columbia River. “Teo Park” means the Port property located easterly of the log cabin lodge, southerly from Cascade Avenue, westerly from Stevenson Landing approach at Russell Street, and northerly from the Columbia River. “Official Sign” means all signs, signals, markings, devices and placards placed, erected or provided by the Port for the purpose of guiding, directing, warning or regulating vehicular traffic or personal conduct. “Pedestrian Access Way” means the public pedestrian path system on Port Property located northerly of Columbia River on the Stevenson waterfront. “Port” means Port of Skamania County. “Port Property” means all real property in Skamania County, Washington owned or controlled by the Port. “Pedestrian Bridge” means the bridge owned by the Port intended for pedestrian use that crosses Kanaka Creek. “East Point” means Port property that is a peninsula located southerly of the River Point building, westerly of the Port of Skamania Cascade Avenue Boat Launch, easterly of Leavens Point and northerly from the Columbia River including exposed land in the Columbia River, which is occasionally submerged. “Vehicle” means every motorized device capable of being used on a street, roadway or path. SECTION 3. Commercial Activity. No person shall engage in any Commercial Activity on Port Property without the prior approval of, and under the terms and conditions prescribed by, the Port. SECTION 4. Littering. No person shall litter on Port Property. For purposes of this section littering is defined as the dumping, throwing, placing, depositing or leaving, or causing to be dumped, thrown, deposited or left any refuse of any kind or any object or substance which tends to pollute, mar or deface. SECTION 5. Fireworks. No person shall ignite fireworks or similar incendiary devices of any kind on Port Property, except when allowed in Washington according to RCW 70.77 and all litter shall be cleaned up. SECTION 6. Animal Control. No person shall permit any animal which is under their care or which they own to run at large, or to be on a leash on Port Property unless the person is in control of the animal. However, dogs are allowed off leash on Port Property one hour before and after sunrise and one hour before and after sunset. SECTION 7. Animal Waste. If an animal creates litter or defecates on Port Property the owner of the animal or the person with the animal who is responsible for the animal shall promptly clean up and dispose of such litter or feces in a garbage or sanitary sewer receptacle. SECTION 8. Launching Boats. No person shall launch any boat or motorized watercraft from Port Property except in designated launching areas. SECTION 9. Vehicle Camping. No other camping/overnight parking is allowed on Port property except as defined in this section. “Self-Contained Vehicle Camper” means travel trailers, 5th wheel trailers, vehicle mounted campers, camper vans, busses, motor homes (Class A, B, & C), that are temporary in nature, used for travel, vacation, and recreation purposes, usually having permanently affixed cooking and sanitation facilities, equipped for sleeping or dwelling purposes, currently licensed, legal to be transported on the streets and highways by private means. “Camping” means sleeping or remaining overnight in a self-contained vehicle camper as defined in 1 above, as applied to this Section 9. “Camp Site” includes the designated vehicle camping areas as marked on the pavement between East Point and Leavens Street, near the pedestrian walkway. Camp sites do not extend onto or across the pedestrian walkway. “Noise disturbance” means that level of noise that causes disturbance to at least three other park users who have complained that the sound level is irritating beyond 15 feet from the origin of the noise. “Noise disturbance” includes, but is not limited to, artificial noises created by devices such as amplifiers for musical instruments and/or loud, profane or obnoxious language that causes a disturbance to any number of park users. Summary: The rules contained herein have been established to allow recreation usage during summer months by allowing limited overnight “vehicle camping” in the East Point designated parking spaces between East Point and Leavens Point from 4 pm Friday evening to 10 pm Sunday night. Camping fee is $10 per night per designated parking space (“campsite”), to be placed in the envelope provided and deposited in to the “Iron Ranger” located on the west end of the waterfront parking area near Leavens Street. Camping vehicles must display the receipt portion of the payment in the lower driver side windshield. Weekend, Overnight Camping at the Stevenson Waterfront is allowed from May 1 to September 30 and is limited toin the designated parking spaces between East Point and Leavens Street. $10 per night per vehicle; self-registration required; receipt must be displayed in driver side windshield. Camping spots are available on a first-come, first-served, no reservations basis. Port of Skamania County is not responsible for lost, damaged or stolen items. Campers may occupy space from 4 pm Friday evenings until 10 pm Sunday evening. Camping during all other times is prohibited. Number of vehicles in a single camp site at one time shall be limited to one car, camper or one vehicle with trailer with no more than 4 persons per site. Only self-driven, self-contained, registered vehicles as defined above are allowed and the vehicle must be equipped for sleeping or dwelling purposes and fit within the designated space. No tractor trailers, box rental, or cargo utility trucks allowed. There are no water, power or sewer hook ups available. Vehicles must be self-contained. No dumping of dish water, shower water, sewage, “black” or “gray” water is allowed. Vehicles must be parked parallel in the spaces; no “circling” or “boxing” permitted. All gear, chairs, car, camper, trailer, etc. must stay within one space. Fire lanes must remain clear at all times. Vehicles blocking any fire lanes will be subject to towing at owners risk and expense. Littering is prohibited. Dispose of trash in receptacles only. It is unlawful to destroy, injure, deface, remove or disturb any public building, sign, equipment, marker, or other structure or property or vegetative plant or natural feature. It is unlawful to possess, use or explode any fireworks or explosives of any kind except as allowed under Washington RCW 70.17. Pets must be leashed while in campsite and owners must clean up after them; owners are responsible for any personal injury or property damage caused by their pet while visiting. Quiet time is from 9 pm to 8 am and Noise Disturbances as defined above are prohibited during these times. Internal and external sound systems must be maintained at a reasonable level. SECTION 10. Hunting. No person shall discharge firearms, hunt, or attempt to trap animals on Port Property. SECTION 11. Fires. No person shall build or attempt to build a fire on Port Property. SECTION 12. Kiteboarding. No person shall fly or in any other manner operate a kiteboard or a training kiteboard on Port property other than at Port designated locations at East Point, Leavens Point, and adjacent waterfront. SECTION 13. Windsurfing. Windsurfing is allowed on the waterfront except from the Cascade Avenue Boat Launch Ramp. SECTION 14. Right of Removal. No person shall remain on Port Property after being asked to leave Port property by the Port Executive Director, a Peace Officer, or by a Port employee acting within the scope of the employee’s duties. No person shall cause or allow their personal property to remain on Port property after the Port Executive Director, a Peace Officer or a Port employee acting within the scope of the employee’s duties has asked the person to remove or relocate the personal property. SECTION 15. Vehicle Parking. Overnight public parking is not allowed on Port property, except for Vehicle Camping—see Section 9 of this Ordinance. The Board or the Executive Director may enact regulations that restrict or prohibit vehicle parking at locations on Port property, or that impose fees or other requirements if vehicle parking is allowed. All such parking regulations shall be in writing, and be on file available for public inspection at the Port business office. No person shall park or store a vehicle on Port Property in violation of a vehicle parking regulation enacted under this section. SECTION 16. Vehicle Speed. No person shall operate a vehicle at a speed in excess of 10 miles per hour on Port Property, unless an Official Sign is posted in an area of Port Property authorizing a different maximum speed, in which event the speed designated on the Official Sign shall be the maximum speed allowed. SECTION 17. Vehicles on Paths. No person shall operate a vehicle on the Pedestrian Access Way or on any other pedestrian path located on Port Property, with the exception of motorized wheelchairs and similar devices, maintenance vehicles, and emergency vehicles. SECTION 18. Official Signs. No person shall engage in any conduct in violation of instructions appearing on an Official Sign on Port Property. SECTION 19. Use of Port Electricity. No person shall connect an electrical device of any kind to a Port electrical power outlet or in any other manner use electricity supplied to the Port on Port Property without Port permission. SECTION 20. Fees. No person shall refuse nor neglect to pay a fee or charge established by the Board or Executive Director for use of Port Property, Port facilities or Port services, when due. SECTION 21. Providing Identification. No person on Port Property shall fail or refuse to provide a driver license or if the person does not have a driver license provide another written document showing the person’s true name and address, when requested by a Peace Officer or a Port employee. No person shall ride a bicycle or other self-propelled device on the pier, except for motorized wheelchairs or similar devices. No person shall dive or jump from the pier. No person shall drive, stop, park, or leave a vehicle unattended on the pier or on the Russell Street approach to the pier. No person shall operate a boat, an airplane or any other type of watercraft in the Boat Launch area at a speed exceeding 5 miles per hour, or in a manner that causes a wake within the Boat Launch area. No person shall park a motor vehicle overnight in the Boat Launch area. No person shall clean fish or perform boat maintenance or repair a boat in the Boat Launch area. No person shall operate a vehicle in the Boat Launch area at a speed exceeding 10 miles per hour. No person shall fly or in any other manner operate a kiteboard training kite or a kiteboard in the Boat Launch area. No person shall stay overnight on a boat moored in the Boat Launch area for more than 3 consecutive nights; attaching to the docks overnight is not allowed. No child under 12 years of age shall be aboard a moored boat in the Boat Launch area if not accompanied by an adult. No parent, guardian, or person having custody or control of a child under the age of 12 years shall allow the child to be in a moored boat unaccompanied by an adult in violation of this section. No person shall jump or dive from the Boat Launch Docks. No person shall ride a bicycle, other self-propelled device or vehicle on the Boat Launch Docks with the exception of a motorized wheelchair or similar device. Swimming is allowed in the Boat Launch area. However, no lifeguard is provided and swimming is at the individual’s own risk and swimmers are warned that the Columbia River has strong currents, cold water and underwater hazards. Life jackets and wetsuits are strongly advised. Swimmers should also be aware that the Boat Launch area is used by powered vessels and the boat ramp area and docks should be avoided when boat users are present. The Port recommends using the “Pebble Beach” area for swimming, which is also unsupervised and swimmers swim at their own risk. SECTION 24. East Point and Bob’s Beach. No person shall drive or park a vehicle, or a vehicle towing a trailer, in a manner that obstructs fire lanes or tenant designated parking areas or occupies an inordinate amount of space. SECTION 25. Port Regulations. The Board or the Executive Director may adopt regulations which define or regulate conduct on Port Property in furtherance of the provisions of this ordinance, or which otherwise prohibit or limit conduct on Port Property. Each such regulation shall be in writing, be dated, be signed by the Executive Director, and be on file for public inspection at the Port business office during Port business hours. If a person violates any provision of an adopted Port regulation the person will be deemed to have violated this ordinance, and be subject to prosecution the same as in cases where a person has violated another section of this ordinance. SECTION 26. Port Permission. A person may act in a manner that would otherwise violate a provision of this ordinance if in furtherance of a Port objective the person is given permission to do so by the Board, Port Executive Director, or a Port employee with authority to grant such permission. If permission is given under this section the permission shall only apply to a particular time or event; such permission shall not be considered ongoing unless explicitly stated as applying to a future date or dates or a future event or events. SECTION 27. Penalties. (1) Any person who violates this ordinance shall be subject to a fine not to exceed $250. (2) Each violation of a separate section of this ordinance shall constitute a separate offense. (3) Each time a separate violation of this ordinance is committed shall constitute a separate offense. (4) The maximum penalty for a violation of this ordinance shall not exceed the maximum penalty prescribed for violation of a substantially similar offense prescribed by the Washington RCWs now or hereafter in effect. SECTION 28. Severability. This ordinance and the regulations published pursuant thereto will be liberally constructed to effectuate the purposes of this ordinance. Each section, subsection or other portion of this ordinance shall be severable; the invalidity of any section, subsection, or other portion shall not invalidate the remainder. SECTION 29. Enforcement of Ordinance. (1) The Board or Executive Director may appoint Port employees as Peace Officers who shall have the same authority, for the purpose of the enforcement of the provisions of this ordinance, as other peace officers; (2) All peace officers of the city, the county, the state and those appointed by the Board or Executive Director shall have the authority to enforce the provisions of this ordinance and to issue citations for the violation of any section of this ordinance; (3) Any person who is issued a citation for the violation of any section of this ordinance must appear in the Municipal Court of the City of Stevenson on the date and time listed on the citation, or in such other court in Skamania County with jurisdiction over the matter as stated on the citation. SECTION 30. Effective Date. This ordinance shall become effective five (5) days after publication as provided by law. Read on: October 8, 2013. Passed this 8th day of October, 2013, by the Port of Skamania County Board of Commissioners.